The best careers often come from building a life around doing what you love or finding a niche and filing it with your talent. Military spouse Yvonne Jones has built a business doing both. The 13-year Army wife loves to write. And with each new PCS she found herself explaining the basics of military life to her friends and family who wondered, why move? Why now? Why there? 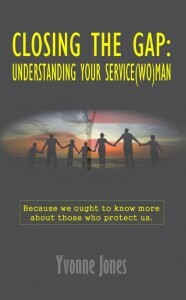 So she merged the two and penned the ultimate guide to explaining this crazy military life to our civilian loved ones. Her recent release, Closing the Gap: Understanding Your Serviceman, serves to answer every question civilians seem to have when it comes to deployment, PCS and military protocol. I had a chance to speak with Yvonne via email about her book and what inspired her to draw back the curtain and show civilians the magic and mayhem that is hard to see from outside the gate. She also gives great advice on not just writing and publishing your own book, but building your own business as well. Here’s a peak at our conversation. Allison: What inspired you to write the book? Was there a specific incident or moment when you thought, ‘Wow, civilians just don’t get it’? Yvonne: “Not necessarily one specific incident or moment. Many, really. And they pop up everywhere you go, if you pay attention to them. Most of my civilian friends, for instance, are always amazed when they hear that our address has changed yet again. And then they usually ask, if we aren’t tired yet of all the moving around, and why we don’t just stay longer. Most believe that the frequency of our moves is dictated by the military family itself, rather than by the service member’s command. Another very important reason that caused me to write this book was the fact that our civilian families and friends seemed to grow a bit resentful toward our chosen assignment locations over the past couple of years, simply because they don’t know what all plays into the decision-making process of the service member’s new duty station. Most assume that we get to choose where and whenever we want to move, which then causes them to believe that we voluntarily chose a place far away from them. Allison: What do you find to be the biggest misconception about military life? Yvonne: “The biggest misconception is probably related to all the issues associated with a military family’s constant moving; you know, issues of constantly having to say goodbye to your friends, of having to find new friends, of having to get accustomed to a new home, of having to find and get used to new schools as a military child, of having to find a new job as a spouse. For most civilians, moving is exciting, simply because they don’t do it as often as we do. Therefore, they tend to project this excitement onto our moves, not realizing that it gets really, really exhausting after a while of having to start a new life every two years or so. To help civilians understand us better regarding the constant moving, I dedicated an entire chapter to it in my book. It breaks the moving process into four parts: Assignment, PCS Orders, Outprocessing and the Actual Physical Move. This chapter also talks about our more personal challenges, such as how we try to reconnect socially, and how doing so is easier for some than for others. Another very important issue that is very hard for civilians to understand is that military families actually feel like they are missing out on their non-military family members sometimes. By this I mean the regular contact with our immediate families. Many civilians are very lucky in that they have their families around them, and with them, which enables them to be able to count on their immediate and extended families’ support at any given point in time. Military families want the same. We, too, want to be close and connected to our parents and siblings. Allison : How was the book received by both military and civilian folks? Yvonne: “I’ve had such wonderful responses so far. The book was published right after our last move here to Tampa, so I didn’t really know anybody here outside of the military. So, I met this wonderful civilian woman, who had just moved to Tampa herself. After she heard that I wrote a book about military life, she was very eager to read it and later stated that she was so glad she did, mainly because it addressed so many issues that she would have never thought to ask about. Through the reading she became aware of our differences as well as our similarities. I am really good friends with her now, and I truly believe it’s because of this book. It laid out our way of life in such a way that allowed her to better relate to me and my family. Another example is this very beautiful email I received from an aunt of someone in the military. And she basically thanked me for opening her eyes to all the issues a military family goes through during a deployment. Most Americans do realize to some extent how hard it is to be separated from your loved ones, but can’t truly comprehend the daily challenges a service member and his or her family has to go through for such prolonged periods of time. Of course, I’ve also received some emails from readers that are either military spouses or in the military themselves. I’ve actually gotten a lot of responses from foreign-born military spouses and also military widows, thanking me for having included them in the book and drawing some attention to their specific issues they have to face in the military. Allison: I noticed the book is self-published, we like to give our readers advice from pros like you. What advice would you give to a spouse who wants to self-publish? Was the process difficult? Is it costly? Yvonne: “A California-based publishing company actually expressed interest in publishing “Closing the Gap,” but I decided against the traditional publishing process, and instead used my own little business as my publishing platform, simply because it was very important to me to extend its shelf life as much as possible in order to give it more time to catch on among readers. Traditional publishers are an author’s gateway into brick and mortar stores. However, books in bookstores only have a shelf life of 30 to 60 days. The great thing about using your own platform is that the shelf is forever. It's a marathon, not a sprint. You have much longer to establish yourself. I always assumed that the actual writing of the book would be the hardest part of the entire process. I realized quickly, however, that it’s actually the research and promotional elements that were the most difficult and time consuming of the entire publishing process. 1. If you have a great idea, take the time to write it down. I’ve had so many people tell me that they always thought about writing a book. Well, do it! You can take as much time as you need; the important thing is that you start! You’ll never publish a book if you don’t start. Holding your own book in your hands is such a rewarding feeling, a feeling you’ll never get to experience unless you sit down and actually start to write. 2. Definitely invest in a good editor! Having a friend or significant other read it is not enough. Finding a professional editor that suits your needs can be time consuming, but a good editor can make all the difference! Be sure to ask for an editing sample to see if the editor is the right one for you and your book. The use of a professional editor was probably the most expensive part of getting my book out. But it was well worth it! 4. If you’re planning to offer your book as an e-book as well, pay someone to convert your book into an e-format. Don’t use an automated conversion service. Those may be cheaper, but it won’t look as professional as if you’d have it done by someone that does this for a living, especially if you have images in your book. 5. Most people don’t realize this until they have their own product out on the market, but reviews are so very important and so unbelievably hard to obtain. Round up as many reviewers as you can. Target a group related to your book’s topic. For example, when I published “Closing the Gap,” I approached a number of top military bloggers and invited them to read and review my book. And when “Teeny Totty™,” my first children’s book, was released, I had a number of potty training experts review it. 6. Definitely have a promotion plan. I always host a giveaway on Goodreads to spread the word about my books. Social media is free and has the potential of reaching lots of people; so use it. Allison: You are not only author but also small business owner. What advice can you give to spouses starting a new business venture? Yvonne: “Yes, I founded LoewenHerz-Creative™ in 2013. It’s a design firm that promotes books of all genres with the production and promotion of exciting and innovative book trailers. Book trailers are like movie trailers, but for books. When my book was first released, I wanted to have a trailer created for it. That was befpre I realized how expensive it was. Sites offering the production of book trailers charge around $250 or higher for a 1- to 2-minute clip. I wasn’t willing to spend that amount, and that’s when I realized I found a niche that begged filling. I created a couple of trailers for two of my award-winning and bestselling author friends and realized that I really enjoyed the process of producing them. Over the past couple of months, I have been able to work with wonderful authors and created an extensive portfolio of trailers. Most of my clients have been referrals from satisfied writers. I simply love to be able to combine my passion with helping fellow authors promote their work! If you find a niche that you could fill with your time, know-how, and skills, go for it. Don’t be afraid of failure or rejection. If you feel like you could provide something that is needed, give it a try. LoewenHerz-Creative has been around for less than nine months now, and has just been contracted by a New York Times bestselling author to produce a trailer for her series. It really does pay off to be persistent. Allison: That is fabulous. Congratulations! Are there any more books in the works we should be looking for in the near future? As a military family, we are constantly changing our place of residence and phone numbers. In an attempt to help our little one retain this ever changing but vital information, I decided to find an easier and fun way that combines my son's love of singing with the necessity of recalling his address. It's a 40-page paperback. The target group for this children's book is between 3 - 6 years of age. Memorizing information such as an address and a phone number can be quite difficult for little children. Children love to sing, and they love their nursery rhymes. So what better way to help them remember their address than with the help of a catchy and fun rhyme, set to an already familiar tune? This book covers everything parents need to teach their children in a fun and creative way about personal safety, including stranger safety, important personal information, and what to do when lost. We all want our children to be safe; and safety begins by educating them early about situations children might find themselves in. All rhymes within this book are written in such a manner that they are fully customizable with each child’s individual information. Want to know more about Yvonne? Find her at http://www.understandingyourserviceman.com.